This wallpaper mural is ready to 'order and print' - or you may customise it. This Shop Front, here configured as a Coffee Shop, is modular in design, and may be configured to represent any type of shop or hostelry to suit your purpose. Please view the How To Customise Tab to see how you may personalise your mural. This Shop Front comprises two drops of wallpaper (one above the door and one to the side) and a Door Print. It is designed to fit around a standard size door frame, and at 280cm high, it is intended for higher walls above 240cm. View the Details Tab for more information. Installing our mural wallpaper and prints is straight-forward and easily accomplished. 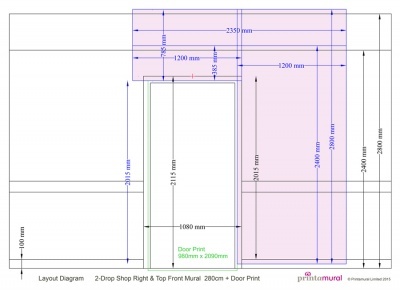 All our mural products come with full installation instructions and a setting out diagram. View the About Installation Tab for information on measuring, planning and for advice about how to install your mural. Door Prints are only suitable for application to completely flat doors. If you do not require a Door Print with your mural, please select the alternative Shop Front mural without a Door Print included. Door Prints are only suitable for application to completely flat doors. If you do NOT require the Door Print, please select the alternative mural without Door Print - indicated on the Information Tab. 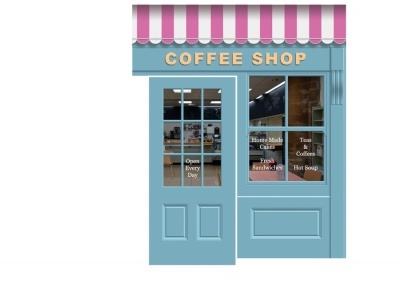 All our Door Prints are printed onto a tough, self-adhesive and laminated vinyl material that has a soft matt finish. They are easy to apply, with a high-tack adhesive that will adhere to most normal door surfaces.